Green spaces in Paris are divided into parcs, which are big, generally in peripheral areas, and jardins, which are smaller but more central and generally surrounded by historical palaces and decorated with statues. Generally, the jardins have no – or very little – grass to lie on. But to me what makes a critical difference is the fact that in the jardins, it is possible to find the greatest piece of (urban) furniture on earth!!! The reclining Chaise Luxembourg! Having a nap on one of those reclining chairs is a must-do during a stay in Paris! 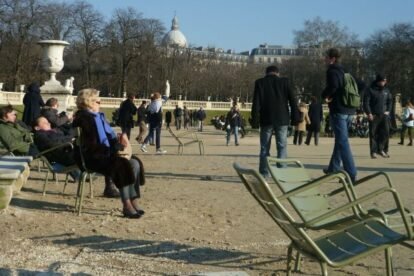 You can find them in the Luxembourg garden of course, but also in the Tuileries and a few ones in the Palais-Royal, close to the ponds and fountains, the edge of which is an excellent place to stretch legs. 1) Don’t give up by taking another uncomfortable straight chair! It would make you a coward. 2) Walk around the pond and observe carefully everyone who is sitting on these chairs, using your psychological skills to guess when they might leave. 3) Be the first (run, jump, fight if necessary) when a chair becomes available again (usually you won’t have to wait more than 5 or 10 minutes). 4) Forget gallantry and courtesy towards old people (after all, they can come back whenever they want if they’re retired). 5) Enjoy! You won’t regret.